Wealthy Nigerians are living large, with the richest among us shelling out billions of naira on private jets and their maintenance. Interestingly, the 250 private jet owners in Nigeria splash an average of N34.9 billion annually to maintain their expensive toys. Encomium Weekly’s check revealed that aside splashing over N1.8 trillion to acquire their jets, they spend an estimated N9 billion annually as salary to their expatriate pilots and N900 million annually to the crew, while a whopping N25 billion is splashed on general maintenance annually by them. Continue..
Information available to Encomium revealed that two expatriates usually man these toys and their take home monthly salary is N1.5 million. That means an average of 500 pilots are in charge of the wheel of these jets. Thus, monthly, the 250 jet owners squander over N750 million and that equals N9 billion annually. Also, an average of three cabin crew members are usually on board and their monthly take home pay is averagely N100,000. Thus, an average of 750 crew members are on the payroll of these wealthy Nigerians and they splash an average of N75 million and their monthly salary and N900 million annually. Furthermore, an estimated N100 million is expended on each jet annually for maintenance home and abroad. These includes daily landing and parking fees home and abroad, A and B checks mostly in the USA, several millions on jet fuel, amongst others. Nigeria has now taken the front seat in the business of private jet ownership which is now a trend and competition among the rich in the country. More exciting revelations have emerged that the penchant for private jet acquisition has cost wealthy Nigerians over N1.8 trillion aside the several billions used to maintain them annually. Investigation by EWy revealed that about 250 private jets are currently owned by them. The luxury trend actually rose by 700 percent between 2007 and 2014 and this has increased the rate of private jet acquisition from 20 in 2007 to over 250 in 2014, which has placed Nigeria and China as the fastest growing private jet markets in the world. Aircraft manufacturers like Bombardier, Gulf Stream, Embraer, Hawker Siddley and Challenger have made Nigeria their huge market because of the demand for these aircraft types. The common brands of private jets in Nigeria are Hawker Siddley 125-800 and 900XP, Gulfstream 450, 550 and 650; Bombardier Challenger 604, 605; Global Express; Embraer Legacy and Falcons. 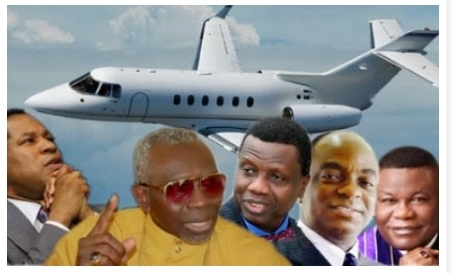 The state-of-the-art private jets being flown by business moguls, pastors, politicians and public office holders in the country are made by one of these manufacturers. Checks by us revealed that Bombardier jets lead the pack wirh over 108 varieties, Gulfstreams followed with an average of 70 jets, Hawker followed suit with 40, while Falcon is becoming a common trend with about 30 pieces and the most expensive being Gulfstream G650 with just two of its type in Nigeria. According to our investigation, an average Bombardier jet goes for N8billion. Thus, 108 pieces will total N800 billion. Gulfstream is N7.2 billion now and 70 of that is N507.5 billion. Hawker jet is N4.8 billion and 40 of that would be N192 billion. Falcon X7 being expensive is N8.2billion and 30 of that goes for N247.5 billion. The most expensive of them is Gulfstream G650 which is valued at N11.5 billion and two of that is N23 billion. Thus the total is N1.8 trillion. According to our source, most of the jets arrived at Evergreen Apple Hangar, Executive Hanger and other private hangars. The four major airports where there is a boom in private jet flights are Abuja, Kano, Kaduna and majorly Lagos. It was revealed that the flights are predominantly plying Europe and America. In Africa, the movements are actually to Ghana, the Gambia, Equatorial Guinea, Uganda and South Africa. We have it on good authority that over 70 percent of these jets bear foreign registration numbers and were being used for commercial purposes indirectly. Industry sources squealed that the alarming rate at which business executives fly private jets within and outside the country revealed the indirect commercial usage of private jets by wealthy Nigerians and a lot of them have more than one jet. They allegedly declared one officially which they registered in Nigeria and another one they acquired but registered with foreign names. They use these ones to fly individuals and corporate executives. It was learnt that this trend informed the unpopular Federal Government aviation policy in 2013, which stipulated that for a private aircraft owned or leased by individuals, only the family members of the owner will be permitted on board as passengers. Tell me why there won’t be Boko Haram in the country. It is just the tip of a dormant vulcano. You can see what they are doing with oil money while millions are jobless and languishing in poverty. For too long, we have been waiting for Godot. Nigerians will have to solve this and other problems themselves. Pikin wey he say him mama no go sleep……..